Onions, bell peppers, and some (optional) garlic flavor these skillet fried potatoes. 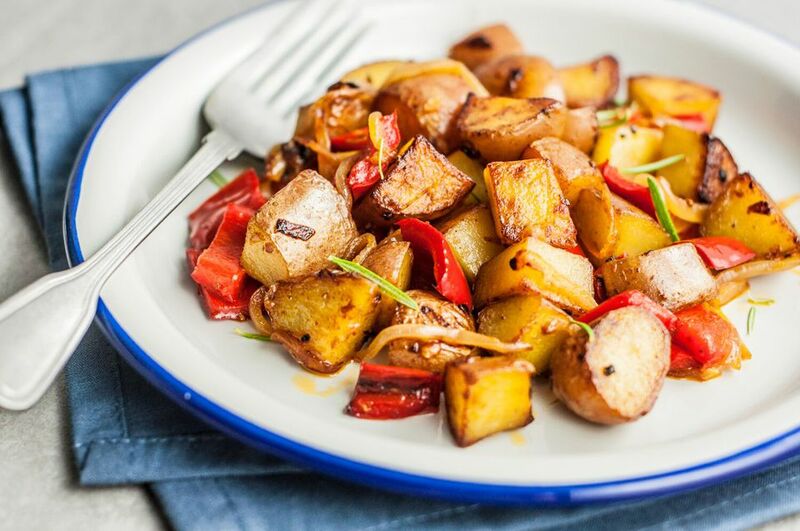 These home fries are the perfect side dish to serve with a hearty breakfast or brunch. They're an excellent dinner side as well. The best potatoes to use for home fries are waxy or medium starch, like red bliss or round white. New potatoes have fabulous flavor when fried, and a good choice if the season is right. You can also make this dish with leftover potatoes. See the tips and variations below the recipe. Heat the vegetable oil in a large, heavy, nonstick skillet or electric skillet over medium heat. Add the sliced onion and sauté until the onion is tender and translucent. Add the red bell pepper and garlic and cook for 1 minute longer. Add the diced potatoes, paprika, about 1/2 teaspoon salt, along with the freshly ground black pepper. Cover the pan and cook for about 10 to 15 minutes, or until potatoes are just tender. Uncover and increase the heat to medium-high. Continue cooking for about 8 to 10 minutes, occasionally turning, until the potatoes are golden brown. Taste and adjust the seasonings, adding more salt, if needed. Partially cook the potatoes to give them a head start and shorten the total cooking time. One good way to cook them is with the microwave oven. Arrange the diced potatoes in a microwave-safe dish, cover with plastic wrap, and microwave on 100% power for about 5 minutes. Add some bacon drippings or diced cooked bacon during the last 3 to 4 minutes of cooking time. Instead of dicing the potatoes, slice them thinly. Herb Home Fries: Add 1 to 2 tablespoons of fresh herbs. Parsley, chives, and fresh thyme are good choices. Home Fries With Leftover Potatoes: Slice or dice the potatoes and add to the pan with the paprika, salt, and pepper. Cook for about 6 to 8 minutes, until browned on the bottom. Add 1 more tablespoon of oil (or butter or bacon drippings) to the pan, flip the potatoes over, and cook for about 5 minutes longer, or until the bottom is browned.